Home 1980s Retro music Whatever happened to... Whatever Happened To...The Whitney Houston We Knew? 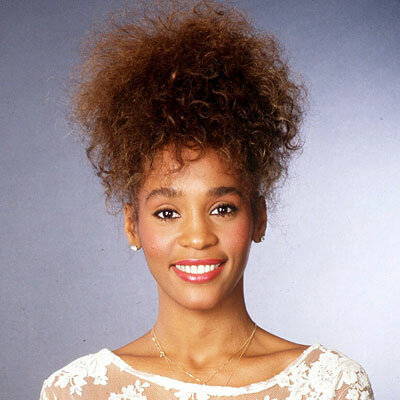 Whatever Happened To...The Whitney Houston We Knew? 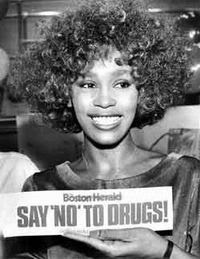 To those who are too young to remember, Whitney Houston’s name may not bring to mind much, except maybe “has-been,” “drug user,” and "loser." However, as a teenager in the mid-80s I witnessed her rise to stardom, and she was HUGE. Houston was everywhere - magazines, TV, music award shows, you name it. I saw her in concert as part of a friend’s birthday party celebration on July 29, 1986. It was almost a year and a half after her debut album, Whitney Houston, had been released and it was a summer night I’ll always remember for two reasons: it was the first “real” concert I ever attended, and because Whitney’s voice and stage presence were phenomenal. It’s a far cry from the woman I watched on Good Morning America last year, when she appeared in concert to promote her latest album, and for a moment seemed poised to make a comeback. Instead she warbled her way through her classic hits and came across as very awkward on the stage. When I recently found my old ticket stub from the 1986 show, I wanted to share some quick memories of that evening, and the singer that I remember seeing – years before Bobby Brown got a hold of her. One of our friends was turning 14 and this was her birthday gift; I believe we had to pay for our own ticket, but her mom offered to pick up all up and drive us into Boston. I hadn’t been to the city since I was a kid, so this was exciting in and of itself. Whitney’s show was part of the city’s Concerts on the Common summer music series, which sadly went defunct some years ago. Part of the Boston Common was cornered off and a stage was set up for performances. 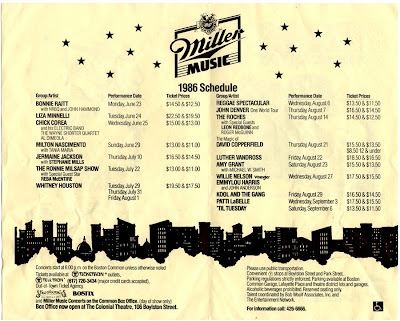 I’m glad I saved the music schedule for that summer, because take a look at the acts and the prices – where else were you going to see Kool and the Gang for only $16.50, or ‘Til Tuesday (Amy Mann hails from Beantown) for $13.50? Plus John Denver, Bonnie Raitt, Luther Vandross, and Willie Nelson? Wow! It wasn’t until I looked at the schedule today that I noticed that Whitney’s ticket prices were the second highest, behind Liza Minnelli, of all of the performers on the program. She definitely was one of the bigger headliners for the Concert on the Common series. Since my ticket stub shows the higher seat price of $19.50, we must have had the better section. I don’t remember being terribly close to the stage, but I do remember being able to see Houston’s face clearly. She was 23 years old in 1986, but definitely commanded the show like a confident woman. She was a glamorous image dressed all in white, long curly hair bounding behind her head, and immediately launched into Michael Jackson’s You Got To Be Starting Something as her opener. From there she alternated between ballads and danceable numbers from her debut LP: Saving All My Love For You, How Will I Know, You Good Give Love, Someone For Me, All At Once, and Greatest Love Of All. (I Want to Dance With Somebody may have been in there as well, even thought that wasn’t recorded until 1987, when her second album, Whitney, was released.) Whitney bantered easily with the audience and seemed at ease for someone in the throws of newfound stardom. And she definitely had some smooth dance moves. Halfway through the show she debated who to toss her sweaty towel to in the crowd (one of our friends, who became a huge Whitney fan, desperately wanted it but alas, we were sitting too far back) before relinquishing it to a couple in the first few rows. What I remember most is that her voice was just amazing. No costumes, no theatrics, just raw talent. I kept thinking that we were somehow seeing a future legend in the making. None of us could have ever predicted how things were to turn out. Back then she was just a pretty and innocent girl with an equally pretty and innocent voice. Speaking of which, one of the reasons we went to see her as opposed to the other top music acts of the time was because of her squeaky clean image. She was one of the few singers that the birthday girl’s strict Catholic mother approved of (I heard she routinely screened my friend’s Tears for Fears and Thompson Twins records for questionable lyrics.) Houston – who modeled for Seventeen and Ms before becoming a singer – was never portrayed as anything but the girl next door in interviews at the time. In person, she also seemed very much aware and normal. We all know what happened during the 90s and 00s. Whitney is now 46, but often looks older than her age. It's a shame, but at least I'll always have the 1986 concert and the memories. Whitney's story is sad. Probably the greatest female pop voice we will ever know. She, in my opinion got selfish and self absorbed, plus the drug use. Those two together have destroyed the voice God gave her to use. What a price to pay to be with a man that thinks nothing of you or his family and lived a lifestyle that she chose to share. She was raised differently, from what we hear. Too bad for her, but she is paying the price now. Sad that we will never heard that fantastic voice again, only on recordings. I wish her the best, tho and hope she continues on the right path for her and her child's sake. Robin, I totally agree. She completely turned into a diva. I did hear her say in an interview several years ago that she never dated anyone in her 20s and then when she met BB she fell for him hard, but he was the wrong guy for her. Such a waste.....she was phenomenal in her youth. One of the first LPs my father bought for me was Whitney's debut record. She was one of the few singers we could agree on (I was all about Top 40, he loved his Motown). Do you remember a few years ago there was a rumor that she had died? Even my father believed that one! I'll be honest, I think Saving All My Love For You is the only song of hers I really liked, but I certainly thought she was beautiful and talented. It's interesting to course her life against Mariah Carey's who both had huge rises to fame and both fell fairly hard, although Mariah was able to get back up. Probably because she had a breakdown which didn't ruin her voice as compared to years of drugs and, I'm guessing, abuse. Also, I heard when she performed on America's Got Talent last year, she hung out all day with her hubby Nick Cannon and watched all the rehearsals and was very approachable and cool. Whitney became really unrelatable in that respect. I love those photos from that magazine. She looks so natural and not airbrushed as all, like a lot of the celebs in fitness mags do now. She was lovely. I'm glad that you had such a good time at that concert. I did like a few of her songs back then. Maybe if she hadn't become such a diva I would still like them. Thanks for sharing your experience and the picture of the ticket stub and list of performers. I would have definitely gone to see Kool & The Gang, Luther Vandross, Ronnie Milsap and John Denver if I lived in that area, had enough money and was allowed to go to concerts. Thanks for the thoughts on her. "The Bodyguard" and the soundtrack, and her powerful singing. And she was completely gorgeous. That is all I choose to think about as the rest is a parable. Rich, I don't remember the rumor about her dying, but I probably would have believed it at first as well. Amanda - I was never a Mariah Carey fan, but I totally believe that she got her life in order and is a more approachable person. And...I still want that aqua and purple bathing suit! 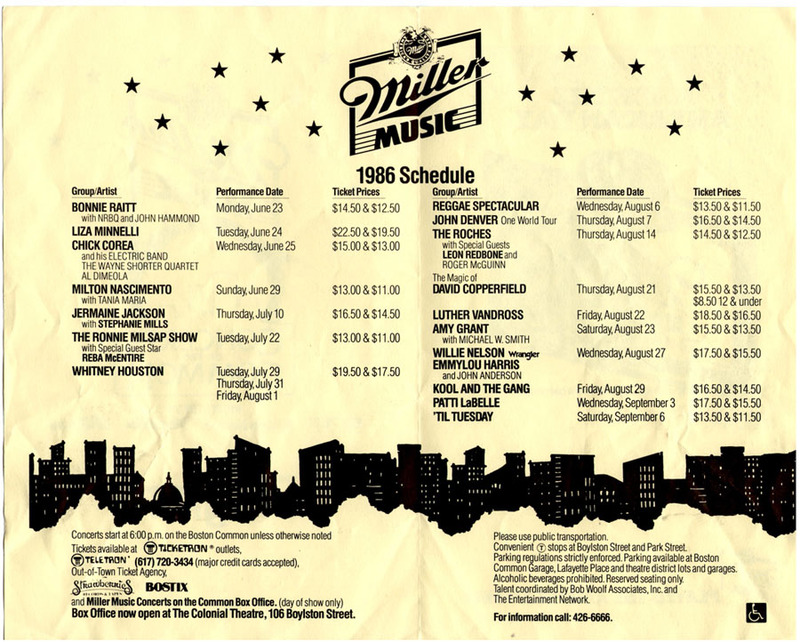 I saw Whitney Houston at the same concert series you did - the 1986 Boston concerts on the common. I was only nineteen and she was one of the first shows I ever saw. Her voice was amazing!! I landed on this blog post while scouting for a "cute" photo of Whitney to put on my facebook. (It's great, by the way, and I'll surely return.) It's now 2012 and Whitney has physically expired. I am a different sort of Whitney Houston fan. I really started rooting for her when I saw her struggling (although I had always liked her music). I felt then, when the media had finally showed its teeth to her and she was cast from the garden of "positive public opinion" that she and I had a lot in common. It was bizarre to me that we had started a questionable war in Iraq and yet the news channels had chosen to tell us very little about that. Instead, the surreal image on my nightly news screen was that of Diane Sawyer holding a supermarket tabloid up to Whitney Houston's face, insulting her appearance and commanding the suddenly frightened and confused pop singer to answer for the "horrible" spectacle she had become. The point, as long as it's taken to arrive, is that I think perhaps Whitney's biggest problem was that America had changed - and not necessarily for the better. She may have had a rough start in life and made her share of bad decisions but back in the 80's and 90's she was never expected to produce immediately satisfying answers to everyone's questions about it. In 12-step recovery, they teach you that drug use is a symptom, not the problem unto itself. I think more people should ponder that before they offer their lectures. The hitch of it is that you'll never know what a drug addict's underlying problem is because you've already punished them for having it in the first place. Drugs should be legalized so that we don't criminalize the ordinary and amplify the consequences of personal failure. The drug war has destroyed millions of families and has had ample time to produce a winner. It's time to call a truce. Let's go REALLY Retro and turn back prohibition. Florida Squeezed--thanks for your comments. At this point it sounds like she was taking prescription medication and drowned in the hotel room's bathtub, and it's unclear if there were any illegal substances in her body. If you believe what the media says then if they pee on your leg and tell you it was raining you'll believe that to. She was killed like all the rest that so called died from drugs. I don't know why people think she was such a big diva or unapproachable. from most accounts, including Mariah Carey, she seemed to very friendly with a great sense of humor. however, I think she treasured her privacy, especially with her drug problem and all, and became irate when reporters tried to delve too far in. If anyone seems like a diva to me, its Mariah. I was truly saddened by her passing. With her, Donna Summer and Michael Jackson leaving so soon it left a void in the music that I loved. FLORIDA SQUEEZE...thank you!! and Canndy..you are right on point. It has been 5 years since Whitney died mysteriously. I wanted to thank you for being who she was and giving all she had on that stage...she sang live..she had over 500 live performance concerts and more than 100 live tv appearances on a vocal chord, not to mention the 4 films she completed...at 48 years old she accomplished a lot as a dark skinned black girl in the 80's making us recognizable just like Aretha and Diana Ross and Dionne....in the 80's we were still fighting for acceptance as black women and Whitney pushed the door open even wider..in music, film and tv and video interviews. She is resting in peace after so many people came at her torture her, but more people loved her than she ever probably knew. Her legacy is eternal love..I would advise you guys to google the performances on youtube and watch her live performances..it is a real treat and you really find out what she wanted us to know about her. She was all about love and so was her daughter...both ahead of the times we live in now. Peace and Love and holding the light up for Whitney and Krissi!!! Also, if you get a chance to watch Whitney's version of the film "SPARKLE" it really answers the question.